A cloud is a collection of water droplets or ice crystals in the atmosphere which occurs because of condensation or moisture compaction that is contained in the air after going beyond the State saturated. A cloud is a visible mass of water droplets or frozen crystals in the region of the atmosphere above the surface of the Earth or another planet. Clouds are formed due to condensation or compaction process of water vapor contained in the air after going beyond the State saturated. 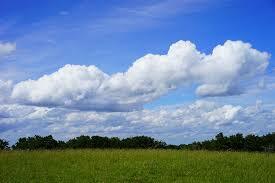 Any water vapor contained in the air will change due to condensation (compacting) into water spots – to form clouds. Clouds can produce rain, rain itself is formed by the process of the water cycle on the clouds. The rain that is formed has many benefits for mankind and the Earth. Some of the benefits of rain is to fertilize crops, water supplies, electricity sources, improve air quality, etc. Clouds can eliminate the hot weather and provide coolness. The cloud also protects us from radiation beams ulktraviolet directly. Clouds can make a man estimate the wind direction so that it can be useful as an indicator of weather and climate prediction. If hot air, more vapor contained in the air due to the water more quickly. Hot air laden with the water then would go up high, to arrive at a single layer with a lower temperature, the steam will melt and then resulting in a molecular cloud, a water point of infinite number. If the clouds are already formed, the point of the water in the cloud will become increasingly large and the cloud will become increasingly heavy, as well as power slowly pull the Earth also pulled it down. To to 1 ranking points will keep falling down. 1 ranking up to those points will continue to fall to the bottom then it rained. But if the dots that water meets hot air, those points will evaporate and get out of the cloud. This is what led to the ever-changing clouds on its shape. The water contained in the cloud evaporates alternates and also melted. It also brought the cause sometimes there are clouds that do not bring rain.